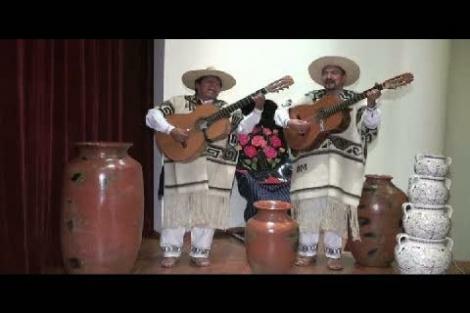 Pirekua is a traditional music of the indigenous Purhépecha communities of the State of Michoacán, Mexico, sung by both men and women. Its diverse mix of styles draws on African, European and indigenous American origins, with regional variations identified in 30 of the 165 Purhépecha communities. A Pirekua, which is generally sung with a gentle rhythm, may also be presented in non-vocal styles using different beats such as sones (3/8 time) and abajeños (6/8 time). Pirekua can be sung solo, in duets or trios, or accompanied by choral groups, string orchestras and mixed orchestras (with wind instruments). Pirériecha (Pirekua singers and interpreters) are renowned for their creativity and interpretations of older songs. Lyrics cover a wide range of themes from historical events to religion, social and political thought and love and courtship, making extensive use of symbolism. Pirekua acts as an effective medium of dialogue between the Purhépecha families and communities that practise it, helping to establish and reinforce bonds. Pirériechas also act as social mediators, using songs to express sentiments and communicate events of importance to the Purhépecha communities. Pirekua has traditionally been transmitted orally from generation to generation, maintaining its currency as a living expression, marker of identity and means of artistic communication for more than a hundred thousand Purhépecha people. Authors and personalities: Luis Fernando Montes Morales, director. Production: Mexico. Secretaría de Turismo, producer.